The Purple Pinkie Nail Salon: Glitter Galore! One of the things that The Purple Pinkie is known for is our art and creative designs. 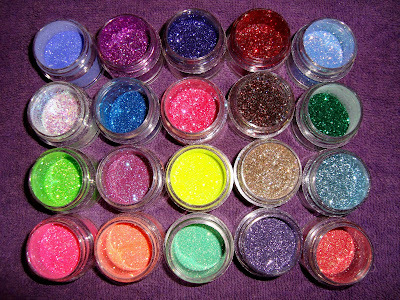 Here are just a few of the glitters we have for you to choose from! We use these wonderful glitters on our fabulous Glitter Toes and for Glitter Tips on your fingernails. Since we are dedicated to our education and regularly attend classes and shows, we provide our client's with the most current trends in the nail industry. In Ford City, Pennsylvania we are no longer four years behind California's trends! Often imitated, rarely duplicated, The Purple Pinkie!